00:35:00 Makes 18 servings, 2 pieces each. Take these ingredients and transform white bread into delicious sweet little appetizers. Preheat oven to 400°F. Mix cream cheese, 1/4 cup of the sugar, vanilla and egg yolk with wire whisk until well blended. In separate bowl, mix remaining 1/4 cup sugar and cinnamon; set aside. Flatten each bread slice with rolling pin. Spread 1 side of each slice evenly with 1 rounded Tbsp. cream cheese mixture. Starting at short end, tightly roll up. Brush each roll with butter; roll in reserved cinnamon-sugar. Slice each roll into 3 pieces. Place each piece, seam side down, on baking sheet. Bake 12 to 15 min. or until edges are lightly browned. Serve immediately. 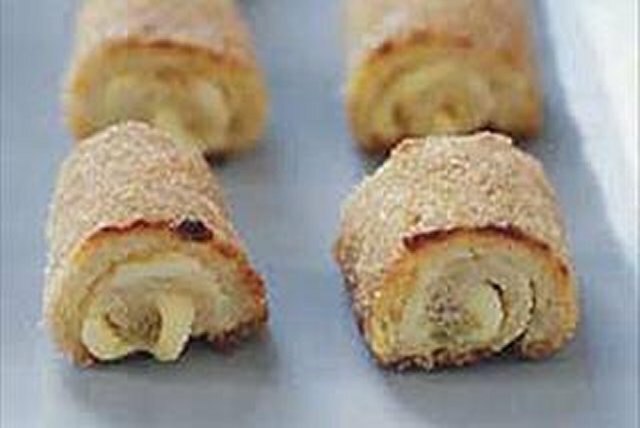 Rolls can be prepared ahead of time and kept frozen until ready to slice and bake. For an extra special treat, baked rolls can be dipped halfway into melted Baker's Chocolate. Serving Size Makes 18 servings, 2 pieces each.